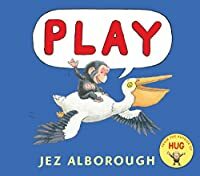 For the perfect bedtime story, the inimitable Bobo the chimp returns in another book of very few words -- and very big heart. It's bedtime for Bobo, but the little chimp isn't ready to stop playing for the day. So he hitches a ride on an obliging giraffe, only to be carried back to his mother when she calls. His mother tells him again to stay, but Bobo can't help catching a lift on the back of a turtle to see what's across the pond and on top of a nearby hill. Now it's getting dark, and he's all alone, with no idea how to get home. “Mommy!” Every mischievous child who has ever resisted bedtime will take comfort in this lighthearted ode to the bond between mother and child -- and the community of friends that surrounds them.